If you’re maxing out your wireless network inside your home or office by streaming video or playing lots of bandwidth grabbing online video games, you may be in the market for a better performing router. A company called Edimax has a new combination pack with an 802.11ac router and USB 3.0 adapter for your computer that promises three times the bandwidth of 802.11n wireless devices. Whereas current 802.11n wireless networks max out at 300 Mbps, the 802.11ac network is good for up to 867 Mbps in theory. 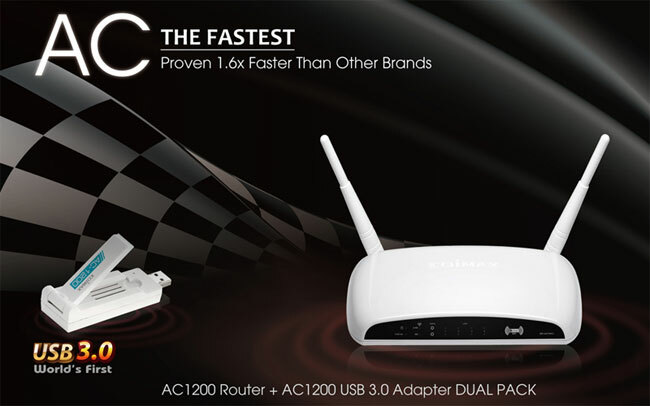 Both the router and the USB 3.0 network adapter have selectable bandwidths supporting both 5 GHz and 2.4 GHz connectivity. The USB 3.0 network adapter is required since the 802.11ac protocol supports more bandwidth than the USB 2.0 port can handle. In real world use, the manufacturer promises that its 802.11ac system is good for up to 360 Mbps of data throughput with 5 GHz Wi-Fi performance. That makes it 1.6 times faster than other brands according to Edimax. There is no indication of how much this router and network adapter combo pack will cost at this time.